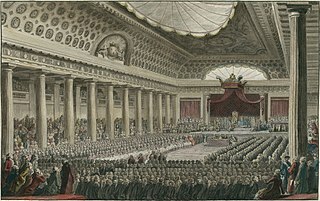 In politics, the terms "left" and "right" come from the habitual seating arrangements in the the Estates General (parliament) during the French Revolution. Those who favored more radical change tended to sit to the left of the president's chair. Those who favored the status quo tended to sit to the right. Legend has it that the more radical members also tended to sit further toward the back of the room. This led to observations that sometimes the most radical people on the left and the right wanted the same or similar things, albeit often for completely different reasons. Sen. Rand Paul, in that arrangement, would have found himself pretty close to the back of the room. Chances are, if I were allowed in at all seeing as I have no official capacity whatsoever, I would be toward the back too. After all, I wasn't asked to blog from a liberal perspective on Louisville.com because I'm so middle-of-the-road in my views! So there we two would sit, all the way in the back, and one day earlier this week, I might have reached out to shake his hand and offer my support for his attempt to force the Senate to include an amendment in the "tighten the screws on Iran" bill. Apparently his amendment was only one sentence long, and it said that nothing in the bill should be construed as a declaration of war or congressional authorization to use force in Iran or Syria. Hats off to him. If there is to be a war with Iran, and lets hope in the most vigorous possible way that there is not, it should be only after the most exhaustive and thorough public debate, and it should be with the express, explicit, authorization of Congress.